ONCE EXPERIMENTAL DATA IS ACQUIRED, THE FIRST TASK IS TO DEFINE A PROTEIN USING THE PROTEIN EDITOR INTERFACE. 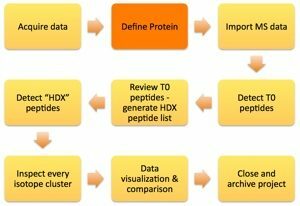 A LIST OF CANDIDATE PEPTIDES AND A BACKBONE PROTEIN SEQUENCE ARE SUBMITTED WITH INPUTS OF SEQUENCE, CHARGE, AND OPTIONALLY RETENTION TIME, DATABASE SEARCH SCORE, AND MAXIMALLY H/D EXCHANGED CONTROL (DMAX) %D MEASUREMENTS. THE LIST OF TARGET PEPTIDES IS USUALLY OBTAINED FROM SEARCHES WITH DATABASE SOFTWARE SUCH AS SEQUEST OR MASCOT. THE RESULTS MAY EITHER BE CONVERTED TO CSV FORMAT AND IMPORTED, OR ENTERED DIRECTLY THROUGH THE SOFTWARE INTERFACE. THE INPUT RETENTION TIME WILL BE USED IF A PEPTIDE ISOTOPIC ENVELOPE IS NOT DETECTED ALGORITHMICALLY WITHIN THE USER DEFINED LIMITS OF PPM ERROR, MINIMUM SIGNAL INTENSITY AND MAXIMUM THEORETICAL FIT SCORE. THE PEPTIDE WILL HOWEVER BE RETAINED IN THE USER INTERFACE TO ALLOW FOR MANUAL CURATING OF THE DATA. IT IS COMMON TO HAVE PROTEIN SEQUENCES THAT ARE DIFFERENT FROM THE CANONICAL SEQUENCE. TO ACCOMMODATE THESE SITUATIONS, AN OPTIONAL REFERENCE SEQUENCE MAY BE ENTERED TO ACCOMMODATE SEQUENCE ALIGNMENT BETWEEN EXPERIMENTAL VERSIONS OF THE PROTEIN SEQUENCE SUCH AS A SUB DOMAIN, AND THE INTACT PROTEIN SEQUENCE. USING THE INTERFACE, SECONDARY STRUCTURAL FEATURES SUCH AS HELICES AND BETA SHEETS MAY BE DEFINED AND WILL BE PROPAGATED THROUGHOUT THE SOFTWARE. ALL OF THE PROTEIN AND PEPTIDE SET RELATED INFORMATION CAN BE SAVED FOR SUBSEQUENT REUSE OR SHARED WITH OTHER USERS.